Mr. Nikolai Sobieslaw is an estate agent, the owner of a large warehouse building that he sublets to several small businesses. He has become worried that one of his tenants is using his space for illegal purposes. Another tenant has reported that Mr. Thad Gillig, operating under the vague name of Clu-Pea Ruber Wholesale Goods, has been getting late-night deliveries of unusually-shaped packages from unmarked trucks driven by men who look more like biker-gang members than normal truck drivers. Pym, who is a crossword-puzzle addict, recognizes that “Clu-Pea Ruber” is Latin for “red herring”, implying that Gillig is daring anyone to learn what he really does. Pym agrees to mount a 24-hour surveillance of the office to find out if Gillig is up to anything that could have unpleasant repercussions for his new client. Meanwhile, several asides establish that Pym is gay; that he has a Native American p.i. mentor, Edgard Moon Bear, with whom he discusses everything; that Pym has been having a lifelong dream/nightmare that Moon Bear is trying to help him interpret through traditional Native American shamanism; and that Pym’s parents mysteriously disappeared when he was only one year old. After several days of nothing happening, Pym and an assistant observe a nighttime delivery that includes a “young woman wearing a light-blue dress, whose wrists were bound, mouth obstructed by a gag, and eyes covered by a thick bandana.” (p. 39) Pym rushes to the top of the building to investigate; something happens; and Pym recovers consciousness in his office being given first aid by a Russian, Alexei Leesavich, who is “on the same side” as Sobieslaw. When they return to the warehouse, everything that was in the Clu-Pea Ruber unit is gone. Considerable p.i.-type action ensues which cannot be summarized because it contains spoilers. The first mention of Furries is on page 82. Jeremiah eventually is led to an alternate world inhabited by therianthropes (Furries) of many species where he is the only human. There is much magic in this world; “magic” is the word that Black Wolf uses, although the reader may prefer to think of it as psionic or paranormal talents. One of them is shape-shifting, and I won’t be giving away anything that the Furry reader will not have guessed by revealing that Jeremiah’s parents were shape-shifting therianthropes who brought him to our world as a baby and turned him into a human to protect and hide him. Now he has been rediscovered, and the Good Guys want to revert him to his semianimal form to join them in their guerrilla fight against the totalitarian government. Jeremiah is a potential leader for two reasons: as the son of two very popular leaders of the underground, he is a powerful symbol for them; and, though he may not know it, he is one of the strongest magic-users/psionic-talents of the therianthropes. 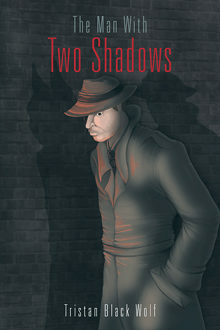 The Man With Two Shadows is less than halfway through at this point. The rest of the story is a competent political thriller of a heroic underground fighting to overthrow the all-powerful, ruthless Ministry of Public Safety and its supporters, featuring fox people, sable people, feline people, horse people, bear people, and so on. Black Wolf continually uses the word “therianthrope” to emphasize that this is a world of “real” human-animal hybrids (with psionic powers) rather than stereotypical fictional Furries, but it is obvious that Black Wolf is aware that this is a literary conceit. A Furry is a Furry is a Furry. Black Wolf describes a fairly detailed parallel world. As with any Furry world, the reader will have to decide for him/herself how convincing it is. The therianthropes have, as appropriate, thick fur and wagging tails; they also wear clothes. A large bear deli counterman has “dark brown-black fur contrasting with the bright yellow apron embroidered with jolly green letters reading BEAR HUGS, NO CHARGE.” (p. 167) The abovementioned wolf-woman is baking corn bread. The Furries have prosaic Western European names, many for no apparent reason beginning with K; the wolf housewife is Katherine Bryner, the bear counterman is Kurt Tercero, and a young badger is Kristopher Ormsbee. “The grizzled old mole …” Are therianthropic moles mole-sized or the same size as the fox people and the bear people and the others? Jeremiah is turned into his therianthropic form and asked to take charge of the underground just as the underground is deciding that passive resistance is getting them nowhere and it is time to switch to massive violent terrorism. He truly takes charge, and finds a different, more peaceful, and more effective solution. I was startled by an “About the Artist” on the last page since the novel is not illustrated. Black Wolf is just crediting the cover artist, Selina Vann. I do not usually review the publisher, but this is the first AuthorHouse book that I have seen and I am very favorably impressed! The trade paperback packaging is faultless. The title page is unusually attractive. The text is entirely typo-free. The acid-free paper is a rich cream. AuthorHouse’s website makes it clear that it exists “to help authors self-publish”; what in the bad old days would be called a vanity press. There are more and more self-publishing companies today. I believe in finding a “real publisher” that will pay you for your book and get it into bookstores across the country; but I could wish that real publishers produced books as attractive as AuthorHouse’s. Syracuse seems to have a lot more furs then I previously thought.